The Moro restaurant was born out of a desire to cook within the wonderful tradition of Mediterranean food, and to explore exotic flavours little known in the UK. It is one of the most talked-about books of recent years, of which Nigella Lawson said ‘This is the book I’ve been waiting for.’ In Moro: The Cookbook, chefs Sam and Sam Clark have distilled the restaurant’s most accomplished and delicious recipes, the dishes that have ensured its extraordinary success. The Moro menu encompasses dishes that originated in Spain and dishes from the Muslim Mediterranean, two areas linked in history by the Moors’ 700-year occupation of Spain. 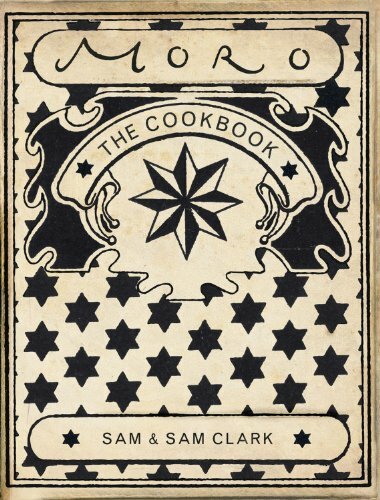 The book is much more than a simple catalogue of recipes - Sam and Sam also communicate the romance and tradition inherent in each dish and their writing is informed by an intimate knowledge of long-established culinary and cultural traditions. In a market saturated with impersonal restaurant cookbooks, this book has a refreshingly different feel. It oozes character and is written and designed with palpable passion and insight. It was an unusual route which led to the establishment of Moro in the spring of 1997: two cooks, Sam and Sam Clark, shared a desire to discover the abundant flavours of the Southern Mediterranean. They married, bought a camper van and set off on a three month journey. They drove through Spain, Morocco and the Sahara, learning, observing and tasting along the way. As they travelled, the two Sams experimented with local ingredients on their small gas hob, gleaning as much information as they could about different regional cooking, and the varying techniques used. Armed with stories, passion and ideas, they bought what they\'d learnt back to Britain, and combined their new knowledge with their shared experience of working at London restaurants, the River Café and the Eagle, to create Moro with their partners, Mark Sainsbury and Jake Hodges. Jake has since gone on to open Bloomsbury restaurant, Cigala, whilst Mark remains the driving force behind the scenes at Moro.